Hello, this is our female GSD Mandy. She will soon be turning 2 years old. 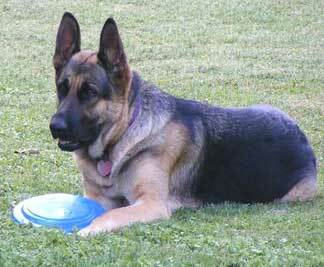 She loves to play Frisbee with our male GSD Cody. Mandy is a very healthy female that weights in at 84lbs. Mandy Loves Kids and other animals and takes up with pretty much everyone. My wife and I have had GSD dogs all our lives, we both grew up with the breed and I will have one for as long as we are able to.